Uniondale, a small town in the Little Karoo, South Africa, came about by the joining of two towns (Hopedale & Lyon) in 1856. Initially known for its wagon building and ostrich feather industries, which later waned and left a quaint farming town. Uniondale lies next to the Langkloof and is predominantly a sheep, goat, seed and apple farming community. Uniondale is ideally situated to form part of circular tourist routes that include destinations such as Oudtshoorn, Baviaanskloof, Port Elizabeth, Knysna and George. It is also on the popular Route 62 and adjacent to the Langkloof known for it's fruit as well as indigenous flora farms. Uniondale is linked to Knysna and Plettenberg Bay (a mere 85km away) by the stunningly beautiful Prince Alfred's Pass. 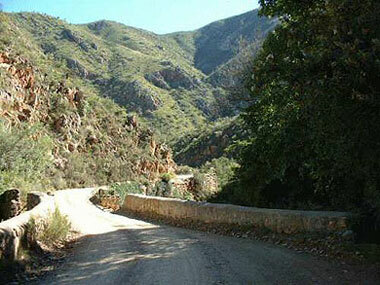 Scenic drives in the area include the Prince Alfred's, Homtini, Montagu and Phantom passes! The Langkloof is another truly beautiful route. The road twists and turns along the foot of the Tsitsikamma Mountain range. Thousands of years ago, there lived a deeply spiritual and artistic people in our area. Discover the rich heritage that they left behind and, although they no longer exist, experience their natural way of life by visiting the Rock Overhangs, where there remains a message from the past. Due to the low rain fall and a limited amount of lakes, streams and dams the birds tend to concentrate in areas where dams and streams occur. This ensures an abundance of birds in relatively concentrated areas. Over 140 species have already been recorded. Black Eagles, Blue Cranes and White Stork are regular sightings. The difficulty levels of these tracks vary and each visitor can choose the most suitable option. Numerous hiking trails will let you see what the ancient San People saw. Enjoy the sight of 6 majestic mountain ranges, over 140 bird species, more than 2300 flower and plant species and over 40 animal species. Hikes range from 1 hour to several days. There is one nature reserve and a number of private game reserves in the area. 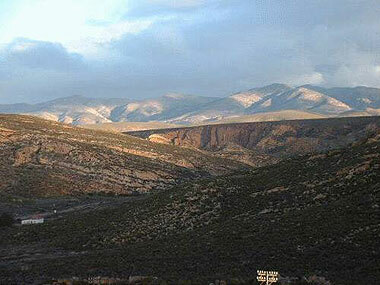 Uniondale is also considered as the western gateway to the Baviaanskloof Wilderness area. Uniondale is blessed with an abundance of game. Of the big five both the Leopard and Buffalo occur in our district. In total the area has 43 species such as Eland, Gemsbok, Steenbok, Ostriches and Baboons. On most farms in the Uniondale area we have large dams that have a variety of fish. Though mainly large mouthed bass, we do have the Outeniqua Trout lodge that specializes in Rainbow Trout.